Line Reactor introduces a specific amount of inductive reactance into a circuit. When a line reactor introduces inductive reactance into a circuit, in affect it is limiting the current in the line which in turn filter the waveform and attenuates electrical noise and harmonics associated with an inverter/drive output. A three phase line reactor is a set of three coils (also known as windings, chokes or inductors) in one assembly. 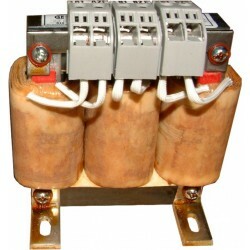 It is a series device, which means it is connected in the supply line such that all line current flows through the reactor. Line reactors are current-limiting devices and oppose rapid changes in current because of their impedance. They hold down any spikes of current and limit any peak currents. Inductors placed at the input and output of electrical equipment, can provide protection and improve performance. Line Reactors absorb many power line disturbances which could damage or shut down your inverters, variable speed controllers or other voltage sensitive equipment. 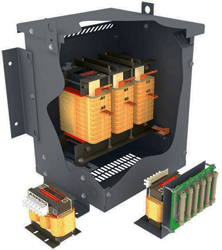 Line Reactors are today's Solution to SCR Drive - Inverter Application Problems three phase AC line reactors when used as input or output filters on inverter electronic speed drive applications provide several significant benefits. Motor Guarding Transient Filters incorporate reactors, resistors, and capacitors. When these devices are placed on the output of adjustable frequency drives they protect the motor windings from the damaging voltage spikes associated with the fast switching effects of IGBT's and long lines and cables.